Includes Power Pulse Muffler AND Connecting Pipe! Designed and manufactured by Racing Beat, the popular Power Pulse Miata Exhaust System is intended for use on all 1990-95 Miatas. This complete cat-back, bolt-on system is easy-to-install and includes all required mounting hardware. 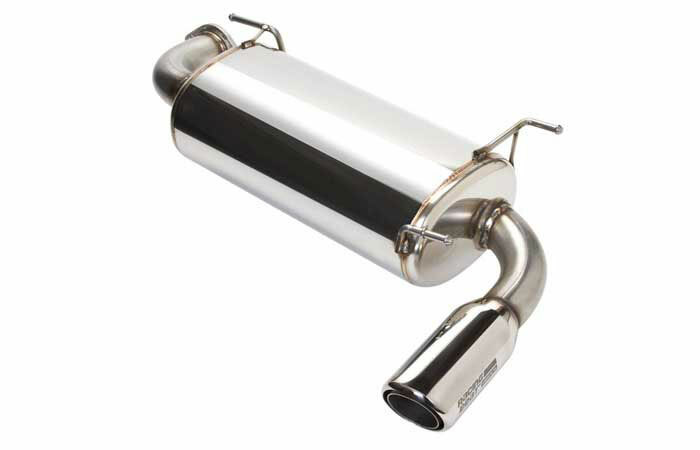 The Power Pulse Miata Exhaust System is 50-state emissions legal and meets all California sound level requirements. The heart of the Power Pulse Exhaust System is the polished 304-stainless steel muffler canister. This polished canister is equipped with stainless steel inlet and outlet pipes which provides superior durability and a stunning appearance. For maximum performance the Power Pulse Exhaust System features the same 2.375" OD Straight-Flow internal design configuration as our RX-7 Turbo II exhaust systems. The 3.5" OD exhaust tip is manufactured using highly polished 304-stainless steel and is slightly oval in shape to provide a perfect balance and proportional look for the Miata's rear bumper. Each tip features a etched Racing Beat logo to add the finishing touch! Designed and tested entirely by Racing Beat, this muffler features a internal combination of stainless steel wool and ceramic sound-deadening packing insulation to provide the optimum exhaust note for your Miata. 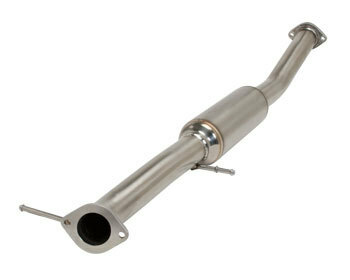 The Power Pulse Miata Exhaust System offers a deep, throaty exhaust note, without any harsh, buzzy or "droning" tones. All Racing Beat's exhaust systems are tuned in-house by our engineering team to produce a modest exhaust tone at low speeds, and a bit more attitude under full throttle acceleration. The Power Pulse Connecting Pipe incorporates a presilencer unit to moderate the sound level to a deep, throaty tone. Both the muffler canister and the presilencer are manufactured using a stainless steel perforated tube core, wrapped with stainless steel wool, and packed to capacity with a high temperature ceramic wool. This design technique allows for a low restriction, straight through design, combined with superior sound dampening characteristics. If you prefer a louder, more sporty exhaust note, we also offer the Power Pulse Exhaust System with a Sport Connecting Pipe (without presilencer). While not obnoxious or buzzy, this sport pipe will allow the exhaust note to rise moderately under acceleration. Less is more, sound that is. My NA is supercharged and I'm running a header as well. The RB Catback is a quiet performance system that lets me hear the supercharger when I'm on it and the radio or conversation when I am not. You'll turn your head when I go by, you just won't know I'm coming from 2 blocks away. Quality is exceptional and so is fitment.The exhaust is flawless. This is a very nice sounding quiet muffler for the Miata. Mine had a VERY LOUD sound when I bought it, and I am really enjoying the less intrusive effect of this new one. If you're tired of having to putt through your neighborhood to be a good neighbor, this would be a good choice. If starting off from a stoplight with a cop nearby makes you sweat, you'll like this one.